If you like to change eye shadow colors often without washing the brushes. If you hate cleaning them, getting them wet, waiting for them to dry and then they never go back to shape. Are you still frustrated of using multiple brushes when applying eye shadow? Are you still clean your brushes with paper towel when switching to the next color? Try this magic sponge. It works like magic!!! Every make up lover needs one! They never use the same brush rule no more. In between switching colors, all you have to do is swipe the brush a couple times on the black sponge and they're clean! Super easy to use. Use it to clean your brushes between colors when doing your makeup. When you want to change eye shadow color, it really works well without having to blend in the previous color. 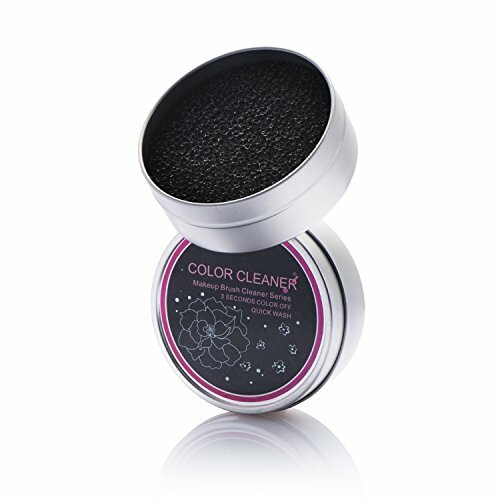 The black sponge cleans off your eye shadow brushes with just a few swipes so you can move from shade to shade quickly. It also cleans off your face powder & blush brushes too. 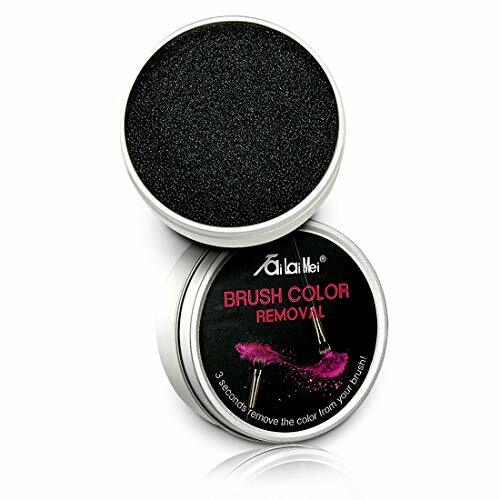 The black sponge takes all the powder off your brushes, even dark sparkly eye shadow is removed. Used for brush color removal, can not replace daily cleaning. Between colors or after your done! Brushes are wiped clean, great until you do your thorough brush cleaning. THE QUICK CHANGE IS LIFESAVER - Even you use high-pigment eye shadow, you just ran the brush back and forth across the sponge a few times, and then ran it across the sponge a few more times, it really remove all remaining color on the brush quickly and effectively, so that you can immediately use it for another color and that helps speed up your makeup process. SAVES YOU TIME AND MONEY - No more wiping them on a towels, wipes or tissues before using the next eye shadow color! It a good temporary alternative instead of having to wash the brush with soap and water every single time. This doesn't replace cleansing your brushes though, but it is a good quick solution for switching colors on the same brush. COLOR REMOVAL WITHOUT WATER OR CHEMICAL SOLUTION - You just take your dirty brush in between colors and brush it back and forth to get the old color off and move onto your next color. The excess powder will drop into the charcoal filter in a metal tin. No liquid or soap, no more chemicals on your brush or contacting your skin. EFFICIENT AND REUSABLE - Both sides of the black sponge are usable. The sponge could be washed and reused, efficient and environmental. The sponge is very easy to clean, just run under water with a bit of soap and allow to dry. You only need to clean it about once a week. PERFECT SIZE FOR TRAVELING - This is the perfect size for any makeup kit, beauty drawer, or for traveling. The convenient compact tin is very sturdy & the lid closes nice & secure. The black sponge can clean your brushes quickly and keeps your makeup bag clean and smudge free! After a successful Kickstarter campaign we are now offering the Luxe makeup brush cleaner on amazon.com! Free Bonus 140ml Bottle of Luxe Cleaning Solution! TOP QUALITY MATERIALS - Made from high grade materials to ensure long-lasting use. 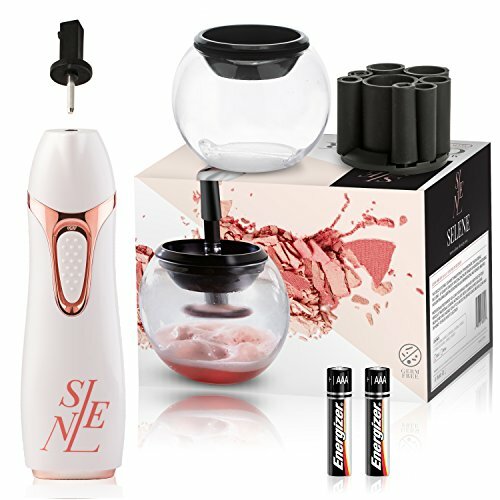 PACKAGE INCLUDES - Brush Spinner, Charging Station, Eight Rubber Collars, Glass Bowl, Bowl Splash Guard Ring, Manual FREE BONUS - Includes a 140ml bottle of the Luxe Makeup Cleaning Solution. 2 YEAR WARRANTY - Use it with peace of mind knowing that we will stand behind our product, if you have any issue please contact our customer service team and we will be glad to help. Warranty does not cover glass breakage due to mishandling. Ever frustrated when you are trying to clean your makeup brushes? Well, stress no more with makeup cleaning mat. you can easily wash your brushes and get every speck of makeup out. Also, the suction cups on theback stick it in place in your sink right at home. This makes cleaning your brushes fun. You work hard to keep your skin looking its best, but you may be overlooking an important step in your beauty routine - your cosmetics brushes. Most experts agree that cleaning your makeup brushes is one of the most effective things you can do to keep your skin clean, radiant and healthy, and it's a step that many people overlook. With everyday use, your cosmetic brushes trap makeup, dirt, oil and bacteria, all of which can clog your pores, irritate your skin and cause unsightly breakouts. That's why professional makeup artists and skin experts say it's essential to keep your makeup brushes clean. With the Selene brush cleaning station, we make it easy to keep your brushes bacteria free and your skin looking its best. Unlike other cleansers that are complicated to use, ours is simple: dip to clean, raise and spin to dry. The whole process takes about 30 seconds and your brushes are clean and ready for use. In addition to keeping your face and skin in good health, regular cleaning extends the life of your brushes, which is important considering how expensive good quality cosmetic brushes can be. Our Makeup Brush Cleaner Spinner System is battery operated so you'll never be stuck if you lose a charger or not being able to use it because the machine needs to charge. Clear your brushes and your mind of worry by upgrading to our Makeup Cleaner Kit Today - Selene - The Perfect Makeup Brush Cleaner!! 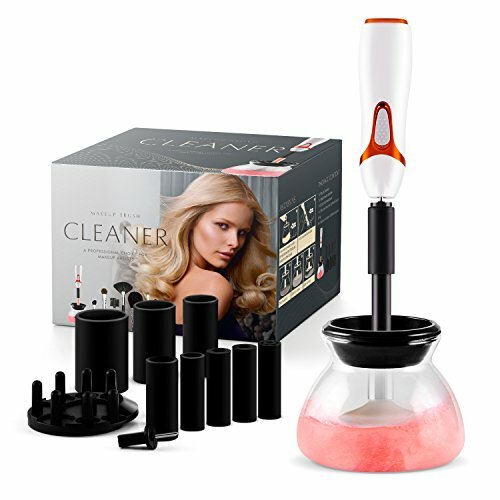 PROFESSIONAL CLEANING AND DRYING MAKEUP BRUSHES KIT: The kit includes variety of high quality tools required for instant wash and dry: Selene Makeup Brush Cleaner and Dryer tool, automatic spinner, 8 collars to fit 95% of all cosmetic brushes, a bowl, holder, easy use set of instructions and 2 AAA electric batteries. SO EASY, SO CLEAN, SO FAST: Start with fitting the cosmetic brush to the right collar. Push the spinner to the bottom of the collar, then, attach the spinner to the machine. Warm water and any antibacterial soap can be used as your cosmetic makeup brush cleaner solution. Point the brush down towards the cleaning solution. Pull the tool up to make your makeup brush cleaner as a dryer. CLEAN BRUSHES PROMOTE HEALTHY SKIN: Professionals and dermatologists recommend you wash your makeup brushes every 2-4 weeks. Makeup brushes trap oil, dirt and bacteria which can lead to skin irritation, clogged pores and acne breakouts. Also, failing to clean your makeup brushes regularly can lead to your expensive brushes becoming damaged and unusable. OTHER BRUSH CLEANERS FAIL TO HOLD ALL BRUSH SIZES AND SEND YOUR BRUSHES FLYING: Selene Makeup Brush Cleaner will hold onto any brush as you spin it clean, without having to worry about constantly stopping to make sure it doesn't fly off. Selene Makeup Brush Cleaner is the ultimate beauty gift for every women. BEST CUSTOMER SERVICE GUARANTEED: We at Selene care about your experience with us and therefore willing to go the extra mile to keep you happy. Your satisfaction is our mission, so we offer you a risk free trial with a 30 day money back guarantee - Try Us!!! Package Includes: 1 x Makeup Brush Color Removal/Switch Sponge Product Description: 1 x Makeup Brush Color Removal/Switch Sponge A dry, makeup powder removal sponge that allows you to switch colors easily without the need of switching brushes Simply glide the brush gently against the sponge surface to remove powder pigment thoroughly and instantly Both sides of the sponge can be used Made of acticarbon scrubbing sponge which can effectively clean your brush without damaging it Compact and light in weight, easy to carry around Wash with cleansing lotion and dry it for repeated use Durable container which is made of quality metal with rush proofing coating Color: Black Size: 82 X 30 mm WARNING: This product can expose you to chemicals including DEHP, which is known to the State of California to cause cancer and birth defects or other reproductive harm. For more information go to P65Warnings.ca.gov. What it does: This cleanser removes excess product, dirt, and oil from blenders and brushes, for a clean makeup application. 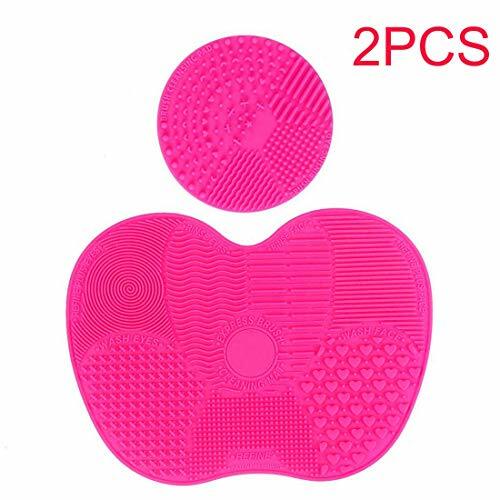 Equipped with a textured, pink silicone pad to gently bounce beautyblender or swirl brushes against the bumps to help the cleanser penetrate for deep cleaning action. Quick, easy, effective and perfect for anyone on the go! What else you need to know: This cleanser supports the integrity of beautyblender as it removes excess makeup residue for a clean makeup application, since it is formulated specifically for beautyblender's exclusive material. Step 3: Set beautyblender out to dry completely in a clean, well-ventilated area and re-use. 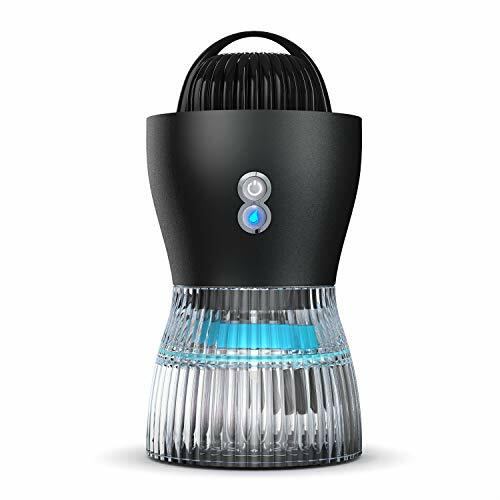 p> beautyblenders need light and air to avoid growing mold. Wet sponges should never be stored in a ziploc bag, a drawer, or any closed space. Use the lid of your canister as a drying pedestal, and set your damp blender on it. Allow the blendercleanser solid to dry on the silicone pad. To avoid build up of germs, professionals recommend cleaning your makeup brushes once a week. But when did you last clean your makeup brushes? The problem is traditional cleaning methods are messy, laborious and can leave brushes wet and unusable for up to 24 hours. StylPro makeup brush cleaner cleans and dries all makeup brush types in seconds, leaving brushes clean and ready to reuse straight away. 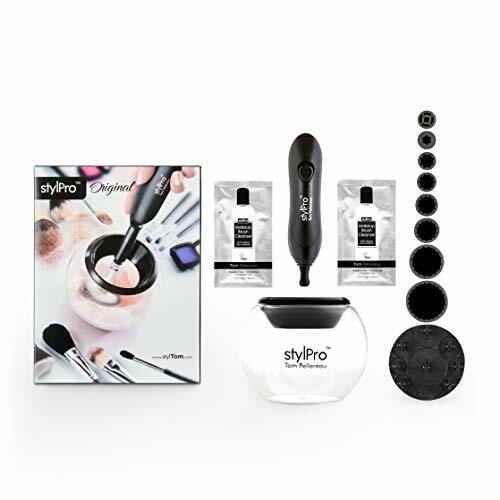 StylPro pack includes: 8 x Flexible silicone collars 30mm, 24mm, 19mm, 15mm, 11mm, 9mm, 7mm, 5mm, Stylpro device, 2xAAA batteries, NEW Tritan unbreakable bowl neck and collar, 2x 10ml StylPro Makeup brush cleanser sachets. STYLPRO STORY over 50,000 sold WORLD WIDE Launched in the UK in Feb 2016 and invented by Tom Pellereau, the Stylpro is the original makeup brush cleaner. Tom is a British inventor best know for winning the BBC The Apprentice in UK. Tom's interest in makeup brushes and their cleanliness was first sparked by a makeup artist who challenged him to invented a faster more effective way to clean makeup brushes. TESTING: To ensure the StylPro spins at exactly the right speed and does not damage brushes. Tom created a machine which could repeat test the action of cleaning a brush and spinning dry 500 times. Photos of the brushes to see if the brush changed at all. MICROBIOLOGICAL LAB TESTING: Independent laboratory ran tests, which proved that the StylPro is as good, if not better, at removing bacteria versus traditional methods. HOW IT WORKS Select the best fitting collar. Attach the collar to the StylPro device. For water-soluble makeup eg blusher, add liquid soap to the bowl. For soluble makeup eg foundation, add one sachet 10ml of StylPro Makeup Brush Cleanser into the bowl. Softly dunk the brush in the liquid, switch on the STYLPRO and spin the brush the liquid for 10 seconds. Lift the spinning brush out of the liquid and leave it to spin. After 10 seconds switch off the StylPro. Your brush will be clean and dry. Scientifically tested Centrifugal Spin Speed to protect brushes. Invented by Tom Pellereau, British inventor best know for winning the BBC The Apprentice in UK. 1. Put some water and soap or baby shampoo into the bowl. 6. Spin the brush to dry it about 5s. Note: The machine is power by 2 AAA batteries, and batteries aren't included. Why do you need a Makeup Brush Cleaner? Because makeup brush is Much Dirtier than what you can imagine! Millions bacterium will born in your brush if you don't wash them in a week. Thus, makeup brush should be cleaned and dried regularly and thoroughly, not only to remove old makeup, but also bacterium and dead skin cells etc.. Our products can not only clean and dry your beauty brush in a amazing fast and effective way, but also be produced in a environmental-friendly way. We guarantee to improve your life quality. Features: - Clean and dry brushes in a few seconds - Perform gentle on brush bristles - Premium material for long-term use - Simple and easy to use - 8 different sizes of flexible rubber holders, suitable for 95% brushes in the market How to use: 1. Pour some water and makeup brush cleanser or natural soap into the cleaner bowl. 2. Insert the brush into a suitable holder. 3. Dip the brush in the liquid for seconds. 4.Pour the liquid out of the bottle. 5. Add some clean water into the bowl and clean the brush again. 6. Spin to rinse. 7. Spin to dry. Package Includes: 1 x Brush Cleaner 1 x Attachment Spindle 1 x Brush Spinner Bowl 1 x Silicone Seal and Splash Guard Ring 8 x Rubber Holders (different sizes) NOTE: The machine is power by 2 AAA batteries (Batteries are NOT INCLUDED) Please feel free to contact us if you have any questions, and we are always ready to help. TOP QUALITY MATERIALS: We carefully select environmental friendly PC material which is nontoxic, elastic and strong to ensure long-lasting and safe use. And also it is easy cleaning that largely simplify your life. CARE & PROTECTION: Comparing with traditional cleaning ways, our electric makeup brush cleaner will not do any damage to your brushes. With reasonable cleaning, the lifespan of brushes will be extended. 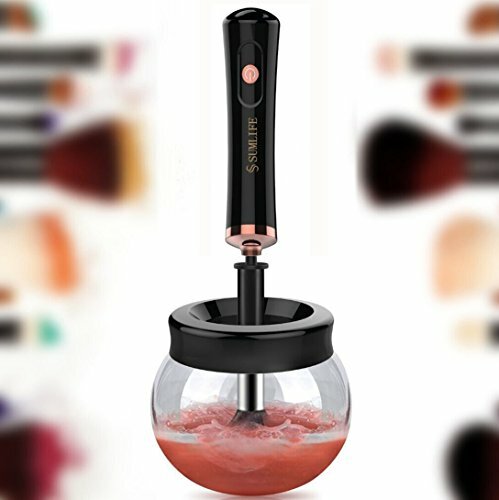 SIMPLE & CONVENIENT: Dip, Spin to Rinse, Spin to Dry, only a few steps and a few minutes, your makeup brushes become cleaned and ready to use, which thoroughly improve your makeup experience and skin health, it is optimized to utilize our product with Ecotools Makeup Brush Cleansing Shampoo. Still frustrated of using multiple brushes when applying eye shadow? Still clean your brushes with Paper Towel when Switching to the next color? 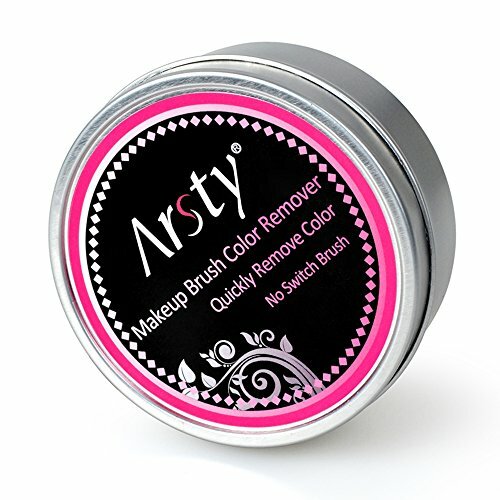 Arsty makeup brush cleaner solution is total game changer for make-up routine. Simply swipe the brush against the black sponge, It Removes every bit of powder from the brushes instantly. No liquid or soap, no more chemicals on your brush or contacting your skin. The Sponge could be washed and reused. When it gets dirty just flip it over and next time wash for 10 seconds and it dries within a few hours. This doesn't replace daily cleansing your brushes though, but it is a good quick solution for switching colors on the same brush. QUICK COLOR SWITCH - Simply glide the brush gently against the sponge surface to remove powder pigment thoroughly and instantly, so that you can immediately use it for another color. SAVE TIME AND MONEY - This will save you tons of money on brushes so that you won't need to purchase separate brushes for each color or over cleaning and wearing them out. COLOR REMOVAL WITHOUT WATER OR CHEMICAL SOLUTION - You just take your dirty brush and brush it back and forth to get the old color off. No liquid or soap, no more chemicals on your brush or contacting your skin. EASY TO CLEAN AND REUSABLE - Both sides of the black sponge are usable. You can flip the sponge over if you want to. The sponge is washable so it can be used again and again. You only need to clean it about once a week. 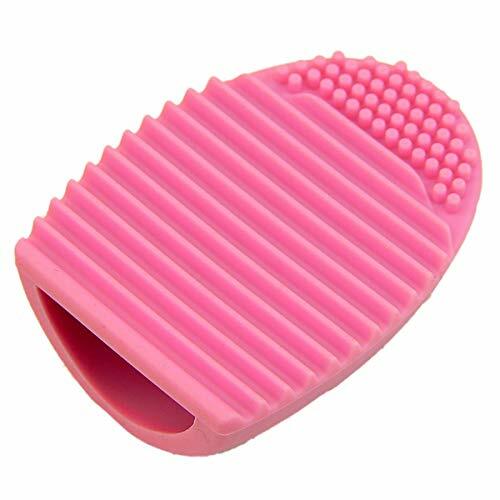 PERFECT SIZE FOR TRAVELING - The makeup brush cleaner sponge is light and does not take up much space. It's perfect size for traveling. LARMHOI makeup brush cleaner will be harmless to your brushes and achieve 98% Cleanliness.Keep your skin healthy,brushes always clean and soft. This cleaner tool can depth clean makeup brushes, not only to remove cosmetics residue,but but bacteria, oil, dirt, and dead skin as well. Keep your brushes always in perfect form. Extends life of your brushes by keeping them clean and soft. Saving your time and money. 8 different sizes to fit different brushes, suitable for 95% makeup brushes in the market. which means you can clean many brush sets. Elegant, top quality, low-vibration design.Stylish package,a perfect gift for makeup lovers.Enjoy healthier and more beautiful skin. Say goodbye to wash brush with hand. Fast clean and dry your brush in 1 minutes with electric makeup brush cleaner, more neat and tidy. 1.Please insert brushes to suitable rubber collar vertically and tightly,avoid shaking and damaging of motor. 2.2 x AAA batteries are required (NOT included). 6. Spin the brush to dry it about 20s. Fast Clean and Dry Makeup Brush - Cleans and dries your makeup brushes deeply in just a couple of seconds. Which prevents breakouts and blemishes by maintaining your brushes clean quicker and easier. 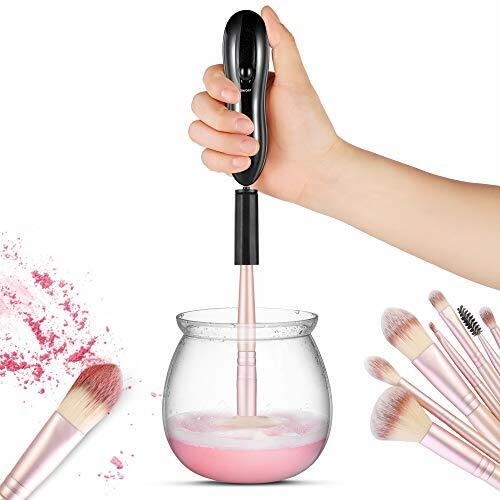 Keep Skin Healthy - Electric makeup brush cleaner achieve 98% cleanliness,prevent dirty and skin problem efficiently by removing dirt and oil on your brushes. Keep your skin more healthy. Easy to Use - Easy with 3 steps of the makeup brush cleaner: 1. Attach brush to spinner; 2. Pour water and soap into bowl; 3. Dip & spin to rinse, spin to dry. 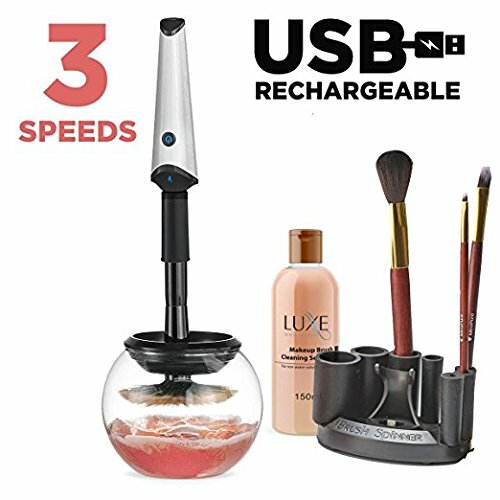 Durable and Portable - Adopt low-vibration design,food grade,eco-friendly,non-toxic,waterproof and odorless material.Moreover,the makeup brush cleaner powered by 2 AAA batteries (NOT included) and very portable,pretty convenient to carry. Warranty and Package - Offer 18 months after-sale service warranty. The makeup brush cleaner includes 8 different collars, suitable for different size brush. Use it with peace of mind knowing that we will stand behind our product, if you have any issue please contact our customer service team and we will be glad to help. 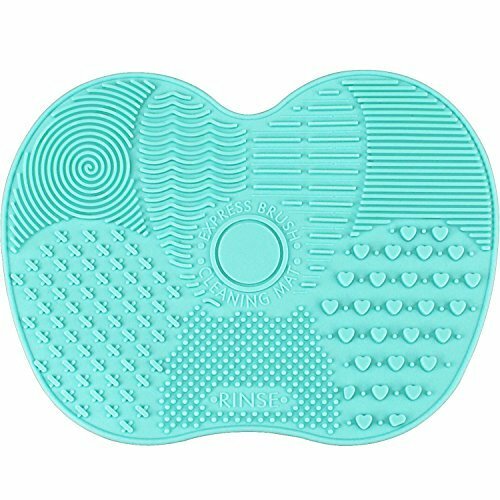 Save your brushes with our makeup brush cleaner mat! A world without makeup brushes is a world we don't feel entirely safe in. Whether you own just one or two brushes that are crucial to your everyday makeup application or you have a specific makeup brush for nearly every makeup product you own, we can all agree they're a staple in our beauty stash. Even when we swap out our foundation or BB cream for a new product, our brushes generally remain the same - which means we ought to take care of them to the best of our ability. Imagine all the bacteria and buildup your makeup brushes can accumulate - imagine having that come in contact with your face! Use these Mat Brush Cleaner Pads to give your brushes a thorough cleanse before applying your makeup. One small and easy step to ensuring you have a fresh face is to let the grooves of this mat take out all the dirt on your brushes! This is also perfect for maintaining your brushes quality. 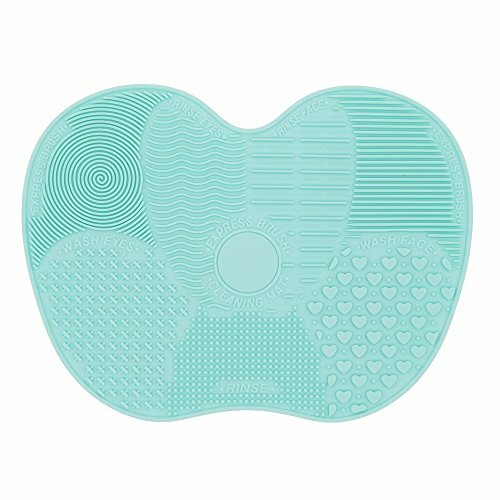 Our Makeup Brush Cleaning Pad ensures that each bristle receives the thorough and gentle cleanse they need and deserve. This brush cleaning pad is thoughtfully designed to ensure the longevity of your tools. Featuring a bendable silicone design to securely suction and fit in your sink, its 7 patented textures along the surface provide a seamless cleansing system for the ultimate wash, rinse and finish.  PREMIUM & SAFE MATERIAL: This Professional Brush Cleaner Mat Set is made with high quality silicon - it is odorless, BPA Free, and non-toxic. We also made sure it is eco-friendly for the earth lovers! The mat is very flexible and can be easily folded or rolled without fear of damaging it.  CLEAN BRUSHES = CLEAR SKIN: Using our cleaning mat on a regular basis will keep your makeup brushes free from germs, bacteria, makeup residue, and dead-skin cells! You will LOVE the feel of clean and soft brushes on your face. Remember to wash the brush cleaner mats after each use too. Soon, your skin should look and feel more clear.  SAVES YOUR TIME AND MONEY: Your brushes will look like new after every gentle cleansing with this great cleaner tool. With our mats, you can obtain professional results anytime and anywhere. It is designed to efficiently clean and prolong the life of your EXPENSIVE make-up brushes.  WHAT YOU NEED: Would you like a portable and effective way to clean your expensive makeup brushes without damaging them? Our Professional Makeup Brush Cleaner Mat Set is the PERFECT solution! The seven-scrubber textures are designed to clean AL types of cosmetic brushes in minutes. These mats have deeper textures and are more STURDY than similar looking mats. You'll also LOVE our NEW gift-ready packaging! What a magical thing is that the dirt left on your makeup brushes can be immediately removed just in a few seconds when you turn on the electric makeup brush cleaner machine. 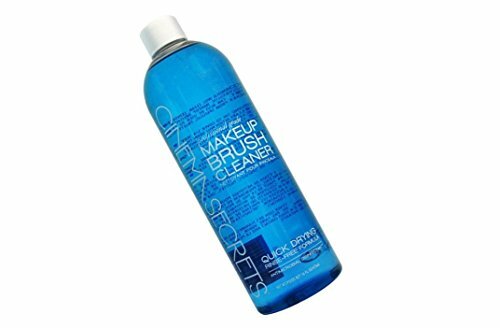 What are the advantages of our makeup brushes cleaner? Our product is made of environmental friendly material. Upgraded and integrated design ensures the makeup brush cleaner more stable when working. We have developed a more powerful motor that can clean and dry your makeup brushes in just 10-20 seconds. There are two different speed levels, fits different sizes of vanity brushes - small or big. non-slip design, reduce noise and shakes as well as energy saving. 1. Pick the suitable holder and the brush you want to clean. 2. Pour some water and soap or baby shampoo into the bowl. 3. Dip the brush into the water. 4. Turn on the spindle, spin the brush to clean. 5. Wash again with clean water. 2 * AAA batteries are required for this product to work (NOT included in the package). Fast Clean & Quick Dry: two level speed automatic makeup brushes cleaner can clean and dry your vanity brush in just minute. Fits different types of brushes and preventing bacteria breeding. Easy to Use: Pour water and cleaning liquid into a bowl; Attach the brush to the spinner; Spin to rinse; Spin to Dry; A cleaned makeup brush. 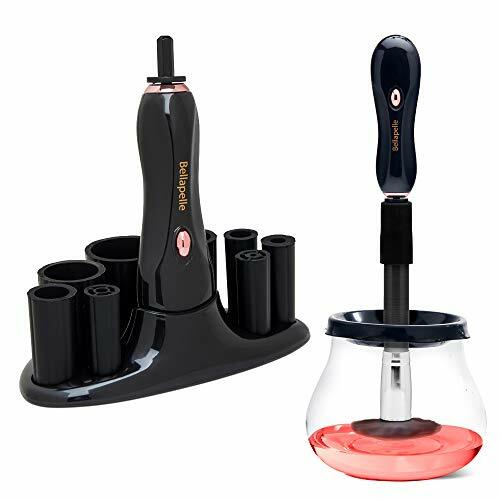 New Version: As there is a phenomenon of slipping in the use of other similar products, we integrate the electric handle with the spindle which makes it more stable. Warranty: We offer 60 days money back guarantee to ensure completely satisfaction. If you have any issue about our makeup brush cleaner please contact our customer service team and we will be glad to help you. Makeup brushes are an investment, whether you re a professional artist or an enthusiast. More importantly, washing dirty makeup brushes is a tedious, but necessary task. Neglecting your brushes not only shortens their lifespan, but it can also lead to breakouts and other skin issues. The TAO Clean Sonic Makeup Brush Cleaner turns a dreaded, time-consuming chore into a quick and easy afterthought, preserving both the brushes and your complexion with minimal time and effort. Using sonic technology and a gentle soap solution, up to six makeup brushes are cleaned in just two minutes. Each TAO Clean Sonic Makeup Brush Cleaner comes with six multi-use TAO Clean Sonic Makeup Brush Cleaner Soap Pods that are cruelty-free, vegan, and free of fragrance, dyes, phosphates, or chlorine. The solution won t dry out or damage your brushes, and works with the swaying motion of the brush cleaner to gently but thoroughly remove dirt, oil, and makeup from in between brush bristles as well as from the tips. In fact, the machine moves each brush back and forth approximately 50 times per second, or about 6000 times a cycle! Just like it s never a good idea to go to bed with a full face of makeup, leaving your brushes dirty creates an ideal breeding ground for bacteria, not to mention it can result in a less-than-perfect application. 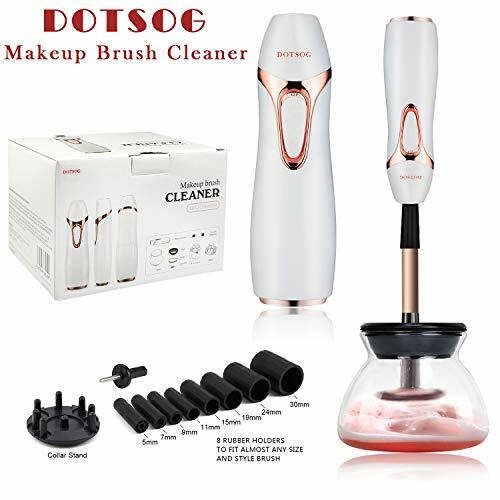 Easy to use and care for, the TAO Clean Sonic Makeup Brush Cleaner will help to keep your skin healthy, prolong the life of expensive makeup brushes, and ultimately save you money and time. Fill the base of the TAO Clean Sonic Makeup Brush Cleaner with 1.5 cups of warm water and drop in 1 TAO Clean Sonic Makeup Brush Cleaner Soap Pod, allowing approximately one minute for it to dissolve. Load up to 6 brushes into the ports of the handle. Place brushes bristle side down into the base. Bristles will be fully immersed. Plug in and press the Power button to start the two minute cycle. When cycle is complete, remove brushes, rinse thoroughly and allow to air dry. In addition to cleaning brushes, the TAO Clean Sonic Makeup Brush Cleaner can be used to Power Rinse and Power Dry brushes. Power Rinse by running TAO Clean Sonic Makeup Brush Cleaner as directed without a TAO Clean Sonic Makeup Brush Cleaner Soap Pod. Power Dry by running as directed without soap or water after which time the majority of the water will be shaken off the bristles. The brushes can then air dry in an accelerated amount of time. Please note that TAO Clean Sonic Makeup Brush Cleaner accommodates makeup brushes that range from 5 - 18mm in diameter, and from 4 - 9 inches in length. Kabuki, double-sided, and some novelty-handled brushes cannot be used in the machine. 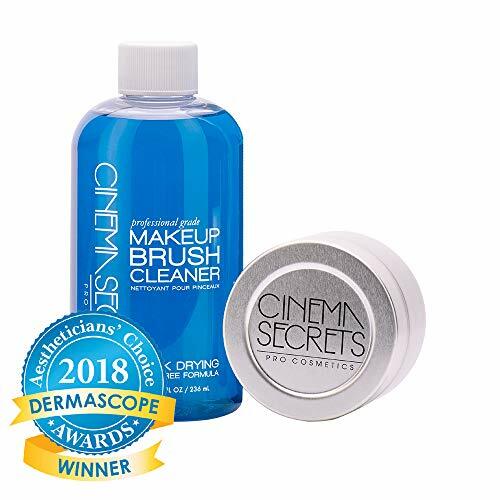 Brushes that are used with heavy, waterproof, or oil-based makeup may require a second cycle of the TAO Clean Sonic Makeup Brush Cleaner, but TAO Clean Sonic Makeup Brush Cleaner Soap Pods can be used for several washes. Clean your machine once a week by wiping down with a soft cloth and removing any soap or makeup residue. Ensure that the cleaner is unplugged before doing so. The TAO Clean philosophy is and has always been, clean & simple. Based in Southern California, our team is made up of engineers, designers, and artists who love to create products that make life s daily routines just a little easier. Our range of skincare and easy-to-use personal tools transform mundane chores into true self-care rituals, and while they look terrific on sinks and vanities, they work even better. We strive to incorporate a wonderful user experience and beautiful design aesthetic into all of our products, because we know that looking good and feeling good go hand in hand. Just take 10 seconds, we can clean it thoroughly. And another 10 seconds, we dry it as new. 1. Pour some water and makeup brush cleanser or natural soap into the cleaner bowl. 2. Insert the brush into a suitable holder. 3. Dip the brush in the liquid for seconds. 4.Pour the liquid out of the bottle. 5. Add some clean water into the bowl and clean the brush again. Please feel free to contact us if you have any questions, and we are always ready to help. 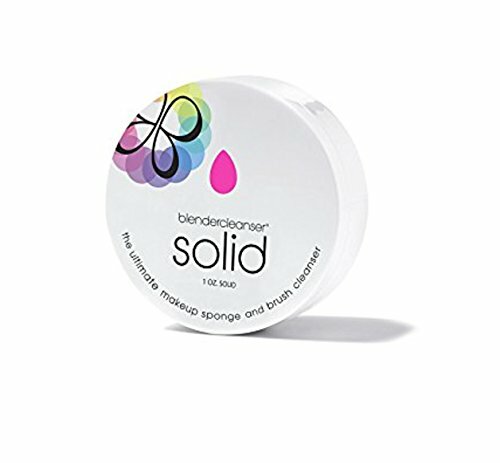 Quick Clean & Dry Upgraded - Just in 8 - 10 seconds for cleans and dries, your makeup brushes are immediately ready to re-use. Easy to Operate - Just 3steps easily to use this makeup cleaner and dryer. 1. Attach the brush to the spinner. 2.Pour water and soap into the bowl 3.Dip & spin to clean, raise & spin to dry. Safe, Durable & Portable - Made from high grade materials to ensure long-lasting use. It is nontoxic, environmental friendly and easy cleaning. Package Included - Brush Spinner, 8 different sizes of rubber holders fits all your makeup brushes, Plastic Bowl, Bowl Splash Guard Ring and Manual. Warranty Policy - We offer 30 days money back guarantee to ensure complete satisfaction & risk free. NOW you can use the same brush when you creating a makeup look using 3 different shades! Just gliding the brush against the surface of the black sponge. It will remove makeup from your brushes instantly and help you easily switch to the next color. The sponge is 2 sided & completely reusable. It can be cleaned by washing it with warm water & soap. It can also be sprayed with a disinfecting brush cleaner for a quick cleanse. A Magic Way to Clean Your Brush - TailaiMei magic sponge will allow you to switch eyeshadow colors easily without water and drying time! Only 3 seconds, remove the color from your brush! How to Work - Gently swipe the brush back and forth over the sponge a few times. The acticarbon scrubbing sponge will remove pigment from your eyeshadow brushes quickly and effectively. Efficient and Reusable - Both sides of the black sponge are usable, flip the sponge and use both sides before washing! How to Clean: The sponge could be reused and very easy to clean! Just run under warm water with a bit of soap and allow to dry. You only need to clean it about once a week. Durable Container - This is the perfect size for home living or travel. Made of quality metal with rush proofing coating. It is also compact and light in weight, easy to carry around. SUIT DIFFERENT SIZES: This brush cleaner comes with 8 different sizes of flexible rubber holders, Perform gentle on brush bristles, suitable for 95% brushes in the market. New fixed spindle is more stable for clean brushes. PREMIUM MATERIAL FOR LONG -TERM USE: We carefully select environmental friendly PC material which is nontoxic, elastic and strong to ensure long-lasting and safe use. 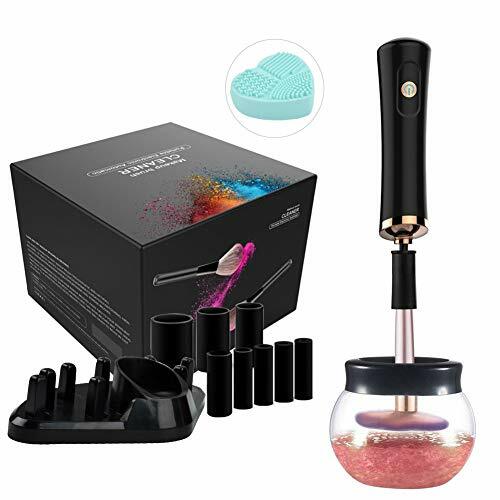 And also it is easy cleaning that largely simplify your life.Moreover,the makeup brush cleaner powered by 2 AAA batteries (NOT included) and very portable,pretty convenient to carry. 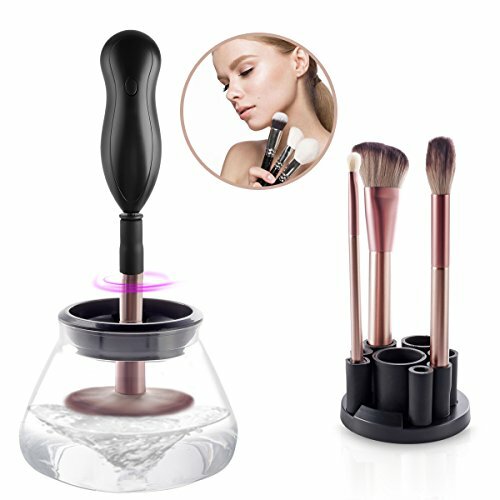 SIMPLE & CONVENIENT: Dip, Spin to Rinse, Spin to Dry, only a few steps and a few minutes, Electric makeup brush cleaner achieve 98% cleanliness ,and your makeup brushes become cleaned and ready to use, which thoroughly improve your makeup experience and skin health. WARRANTY&SUPPORT: 7*24 online support standing by, RISK FREE 100% money-back guarantee, 1-Years Replacement Warranty and life-time technical support. Any inquiries please Contact Us freely. Our customer service team care about providing customer's nice shopping experience.